On the 11th of June, Eduar Pommer from Cologne, Germany beat the record as the eldest person to ride the terrifying Tower of Power. 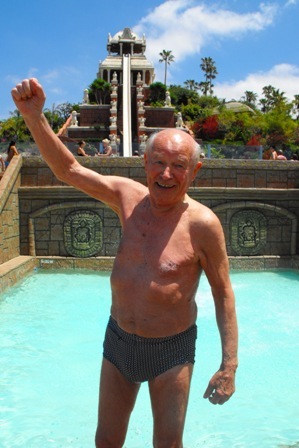 Eduard Pommer, an 88 year old man went down the incredible 28m high and 76m long slide. Riders can reach up to 50 km/h down the Tower of power giving you a 0 gravity sensation before you pass through the giant aquarium with tropical fishes and piranhas, ending in the reception pool within seconds. Whoever dares to beat this record or is just after an adrenaline rush, the Tower of Power is this summer´s choice.